These excellent silencers are light, durable and give very good performance and sound. All kits include everything needed to fit them to your bike. Available in Stainless, Black Stainless (Inox), Titanium and Carbon depending on Model. 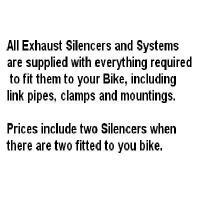 Certificate of Approval CE e9 is supplied with all silencers approved by EU regulations. Racing silencers reach a maximum noise level of 102 dB. 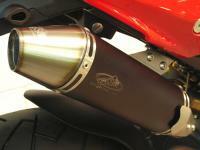 When you remove the dB baffle both silencers provide the same performance.